Sarawak Sports Corporation chief executive officer Dr Ong Kong Swee (second left) briefs Dr Abdul Rahman (centre) on the stadium plan as others look on. 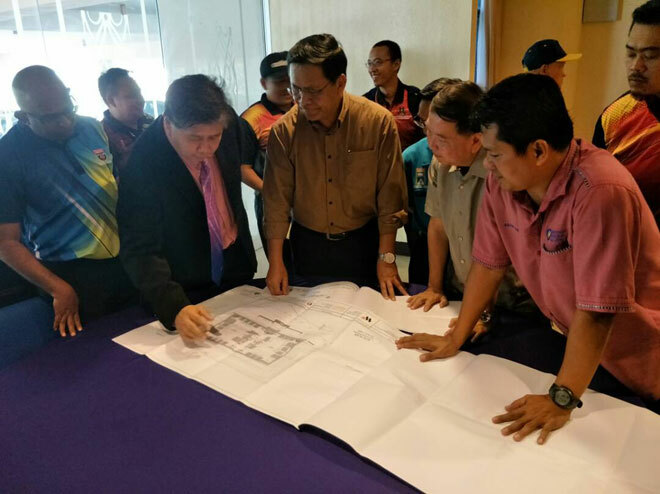 MIRI: Sarawak will become the first state in Malaysia to have a full fledged handball stadium in about two years time. Assistant Minister of Rural Electricity Dr Abdul Rahman Junaidi said the RM40 million stadium would be built next to the Gymnastics Stadium at the Sarawak Stadium Complex. “We have met the Chief Minister Datuk Patinggi Abang Johari Tun Openg last year and he has given the green light to build the facility. “It is high time that Sarawak has a stadium for handball because the sport is now very active and getting very popular especially that we are able to start at school level and expand it to universities,” said Dr Abdul Rahman who is advisor to Sarawak Handball Association (Saha). The Pantai Damai assemblyman said Saha president Norani Drahman would sit down with the permanent secretary to the Ministry of Tourism, Arts, Culture, Youth and Sports Hii Chang Kee to brief him on the details. The construction of the stadium of international standard is expected to commence this year and be ready by 2020.
that has a stadium solely for handball while in other states, handball has to share with other structures for their activities,” added Dr Abdul Rahman. He hoped that handball would become one of the top sports in Sarawak one day when associated with the state’s sports achievements. “Nowadays, when you talk about Sarawak sports, it is all about wushu, taekwondo, swimming and others,” he noted. Once the stadium is completed, Dr Abdul Rahman said Sarawak would be able to organise international handball competitions just like other sports like aquatics, athletics and badminton.